Verbier boasts some top-notch pistes, specialises in itinerary runs, beautiful chalet architecture, and has a vibrant, exciting social atmosphere. No wonder we’ve chosen to make it the heart of our ski instructor training programme and the base for our Verbier Ski School. 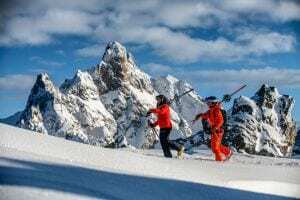 Like some of the high-end French resorts, Verbier is a playground for the rich, famous and royal, with regular visitors such as James Blunt, after whom a lift has even been named. The scenery is spectacular in this popular resort and although Verbier is renowned as a challenging place to ski there is a dedicated beginner area at the foot of the mountain. Then for the more advanced, there’s plenty of bumps, off-piste and itinerary runs to ensure your thighs are burning by sundown. Situated in Valais canton of Switzerland, Verbier is part of the 4 Valleys ski area, with linked access to the other resorts of Thyon, Nendaz, La Tzoumaz and Veysonnaz. As part of the biggest ski area in Switzerland, you’re never stuck for choice on where to ski and explore during your stay! Think Verbier might be the resort for you? Here are all the reasons we love Verbier. Find the lesson that suits you with our Verbier Ski School. Click on the image to download a high res piste map for Verbier and the wider 4 Valleys. Verbier is well known for it’s après and nightlife scene, with tons to offer party goers. Famous for hosting many-a-partier, Verbier has plenty of spots to let loose – in your ski boots or not. Le Farinet – You can’t miss this famous spot. It combines après, cocktail lounge and nightclub all in one. There is a new live band every week in the apres ski and it normally gets pretty wild (crowd surfing, beer drinking etc) Next door is the Lounge where famous DJ’s play and celebs hang out. Le Rouge – Situated at the end of a ski run it has awesome après ski with DJs and balcony. Etoile Rouge – A supper club in town which offers dinner with entertainment before it transforms into a nightclub. Pub Mont Fort – The perfect place for happy hour and après ski just next to the Medran ski lift. This is a famous place in Verbier and hangout of many a seasonnaire. It has amazing food for a decent price and the burgers are to die for! Bar 1936 – Another great après ski bar that’s on the slopes on the way down to Medran. It often has a live band and deckchairs to take in the sun. Mouton Noir– If Folie Douce style après is your thing, check out the new après ski spot on the slopes. Situated near the Ruinettes station, it has a fantastic restaurant and DJ’s, dancing and shows to entertain until the lits shut. Loft Bar – The loft is a local’s favourite and instructor hangout that is welcoming to everyone. It has cheap drinks and a great party atmosphere. T Bar – A good place for cocktails, live evening music, and sporting events. You’ll often find New Gen instructors Zac and Max playing in their band Whisky Thieves here. Fer a Cheval – A great restaurant and a place for all types, après ski, evening etc. with tons of sun and a central location. Verbier was first skied when a group of enthusiasts decided to hike up the mountain a whole 15km back in 1925. But it wouldn’t be until the 1940’s that the first lift was put in. In 1951 it was time for the lift system to hire their third employee! Verbier’s history goes back to the 12th century which is when it is believed that the Verbier castle was built. You can still find ruins today but it was mostly tore down in the 1400’s. Before the ski resort, Verbier was a quaint area with a number of hamlets and villages dotted along the mountain. Today you can still find the charming windmills and chapels that so marked that time. Verbier continued to grow in the ’50’s but it wasn’t until the big ski boom of the 1960’s that Verbier took off into the adventure sports capital that we know today. 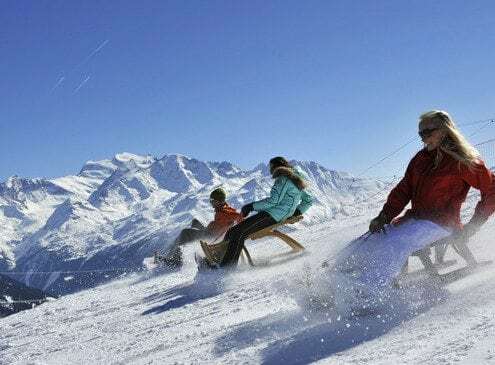 How can I get around Verbier? There is a free bus service that runs circular around the resort. Verbier has a free bus service that runs from Carrefour all the way down to Verbier village. It runs every 5-10 minutes from 8am – 6pm. All lines run through the supermarket stop (Migros), Ermitage car park in Place Centrale, Medran lift station and Savoleyres lift station. So if you need to get to any lift station, it doesn’t matter which one you get on. It is important to get the right number to get to your destination. Luxury resort hotel with ski in/ski out access. Stunning and spacious rooms and suites with extraordinary views. Great value hotel right in the center of Verbier. Ski Verbier Exclusive specialises in unrivalled luxury chalet holidays in Verbier, since 1992. A small and professional ski operator offering catered and self-catered chalets and apartments to Verbier. Luxury, tailor-made holidays with an excellent standard of service, gourmet food friendly and professional staff. Ski deals and cheap holidays with the biggest tour operators in Verbier. Where can I get my ski equipment? There are a number of ski shops in Verbier, but we recommend using Ski Service. These can be found on the official Verbier site. 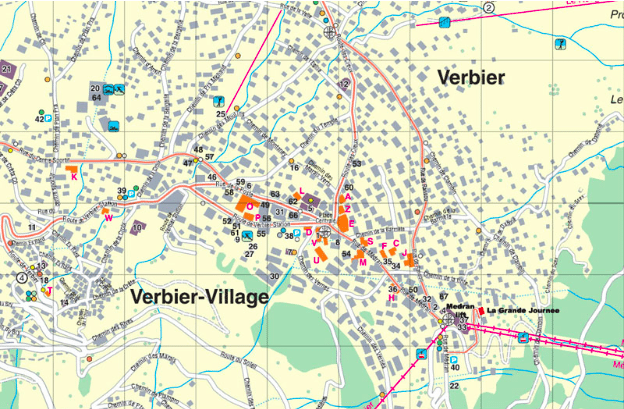 Where can I find more information about Verbier? PAM – is just off the roundabout at place central. Migros – at the bottom end of town. Co-op – near the cordee des Alps hotel at the bottom of town. Cheese shop – La Chaumiere is awesome it does a really good cheese fondue mix, one of the best around! 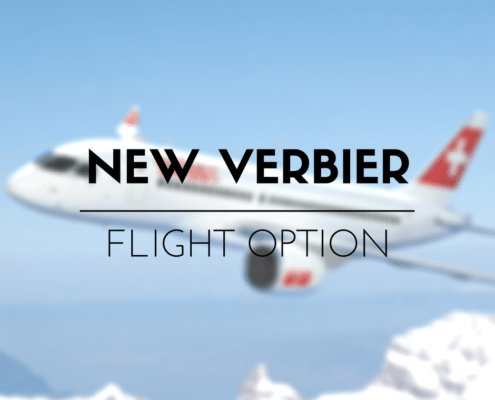 What services are available in Verbier? Doctor – Dr Stefan Popescu is the best doctor in town, located on Route des Creux. Pharmacy – There are a number of pharmacies in resort. The easiest one is located right in the center. Tourist Office – Also right in the center on the roundabout of Place Central. Post Office – Mail your post just off Place Central next to the bus stop. Bus Stop – In Place Central, next to post office. This is where the Bus up from Le Chable arrives. Newsagents – There is a shop called Naville, once again just on Place Central. What non-skiing activities are there in Verbier? 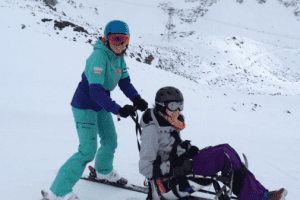 Lottie and Emma, from Mountain Beach Fitness Retreats, offer whole body innovative workouts designed systematically to compliment your skiing, speed up recovery and enhance your performance on and off the piste. Sessions vary from high intensity cardio and strength conditioning, working on ski specific skills such as agility, balance, co-ordination and power, to active recovery and assisted stretch sessions. Training is offered either 1-on-1 or in private groups with a maximum of four. 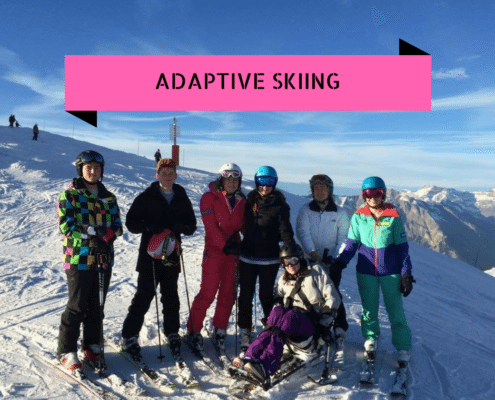 Sessions are tailored made to suit individuals and the in-chalet service means Lottie and Emma can come straight to you, unless you fancy their ethos of fresh air, outdoors training! Or, if you fancy venturing out of Verbier for the day for a little adventure then perhaps our friends at Frost Guiding can help? What about in the summer? Mountain Beach Fitness Retreats run transformative, holistic fitness retreats in Verbier, Tuscany and Salcombe and have hand-picked beautiful accommodation to relax in, while providing nourishing meals to fuel you through to the next day. Their focus is on outdoor training, taking advantage of the stunning natural environment each place is situated in, and focusing on primal and functional movement patterns. The range of activities includes high altitude hikes, trail running, TRX, HIIT circuits, Par Cours Vita training and daily yoga, balanced with active recovery sessions and fresh, healthy, nutritious meals. Guaranteed to leave you feeling restored, rejuvenated and ready for action!